Season Seven of Dexter kicked off last night right where it left off. As one of the greatest cliff hangers in Dexter history, last season we were left to wonder just what happens after Deb catches her older brother in all his serial killer glory. For all of you Dexter fans out there, this has been a long time coming. Just how long did we think Dexter (who works for the Miami Metro Police Department none the less) could go before getting caught? The answer… six seasons. After spending all of last season trying to find The Doomsday Killer, Dexter (Michael C. Hall) finally gets his rubber gloved hands on him. 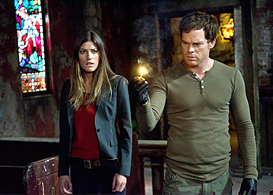 Just as he is plunging a knife into Travis Marshall’s chest, his sister Deb (Jennifer Carpenter), catches him red handed. Generally, most series season cliff hangers return the next season with a simple explanation as to the complicated ending viewers were forced to ponder during the hiatus; but not Dexter. Deb caught Dexter in the act, and there was no turning back. Without being able to adequately explain all the details surrounding his kill to his sister, and being the great cop that she is, Deb couldn’t look past what she saw. The more she thought about it, the more her suspicions increased. Asking him, why was he wearing an apron? Why did he have the knives and the plastic wrap? It just didn’t add up for Deb, and I was pleasantly surprised by this. I thought at some point Deb would let Dexter off the hook, but as the episode continued her suspicions only grew. After last season’s weird incestuous love twist (with Debra starting to fall in love with Dexter, her adopted brother) I had my concerns that the writers were out of material for the final two seasons. By the end of this first episode of the seventh season, however, I can’t wait to see what the writers have in store for us die hard Dexter fans. Going back to Deb’s increased suspicions: at the end of the episode we are left with her sitting in Dexter’s apartment upon his arrival home after another kill. Deb is surrounded by everything Dexter never wanted her to find, consisting of hard to deny evidence that the kill she witnessed was certainly not his first. This image easily could have been used as a finale cliff hanger for the end of this season, which makes me think we viewers are in for quite a ride with the remaining episodes. Although Deb’s suspicions and Dexter’s lies stole the excitement of the show last night, in true Dexter form we were introduced to a new bad guy whose story will surely unfold in the upcoming episodes. We were also left to wonder, what was going to happen with Captain LaGuerta (Lauren Velez) finding the blood slide that Dexter carelessly left at the staged suicide scene of Travis Marshall? Her finding certainly leaves room for Dexter to be pinned with the crime, even if he does convince Deb to move on. All in all, I was not disappointed in the least bit with the season seven premiere. All I can say is, I can’t wait for next Sunday!